Water is life and all animals, horses included, cannot survive and thrive without free access to clean drinking water. Proper hydration is essential to every bodily function including respiration, digestion, thought, reproduction, lactation and more. So how much water does a horse drink a day? 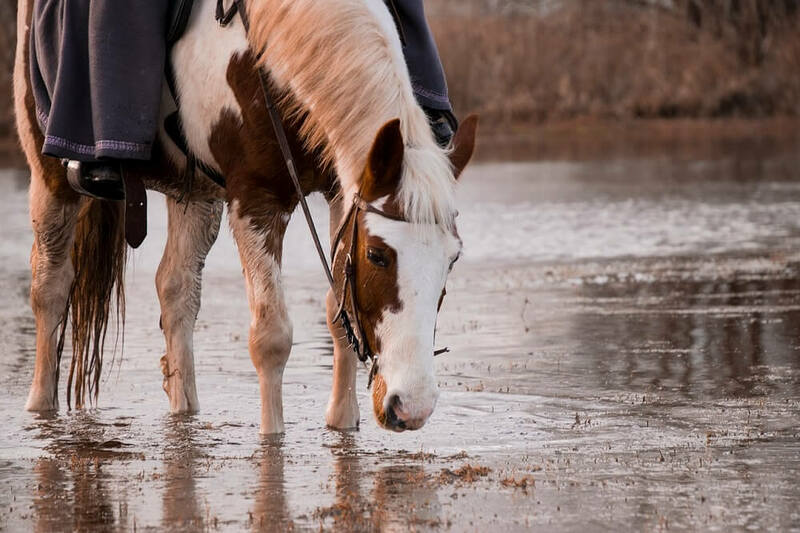 In this article we discuss the importance of providing your horse with ample, clean drinking water and share some smart tips to help you keep your horse hydrated. Read on to learn more. 1 Why Do Horses Need Good Hydration? 2 How Can You Tell If Your Horse Is Dehydrated? 5 How Good Is Your Water? 6 Does A Horse Need More Or Less Water In Winter? 7 How Can You Keep Your Horse Well-Hydrated? Why Do Horses Need Good Hydration? 1. Blood vessels (intravascular space) holds approximately five percent of a horse’s total body fluids. 2. Fifteen percent of the water in a horse’s body can be found in the areas surrounding blood vessels (extracellular space). 3. Approximately half of the liquid in a horse’s body is contained within cells (intracellular space). This level of fluid is most important because it helps regulate the functioning of all cells throughout the horse’s body. If this level drops by as little as ten percent, a horse can suffer serious functional and health consequences. 4. Thirty percent of water in a horse’s system is held in the cecum and the large intestine (the gut). The cecum acts as a sort of reservoir or holding tank to replenish water to the body in the short term. A horse’s brain is made up of about 85% water. The brain and the central nervous system (CNS) are bathed, cushioned and lubricated by water. Good hydration is necessary for good vision and hearing. Eyeballs are made of mostly water and must be kept moist to function properly. There is also liquid in the inner ear which vibrates and relays nerve impulses to the brain in response to sound. Proper hydration helps your horse regulate his temperature through sweating. How Can You Tell If Your Horse Is Dehydrated? If your horse does not have enough clean water to drink, dehydration can cause a wide variety of healthy problems. 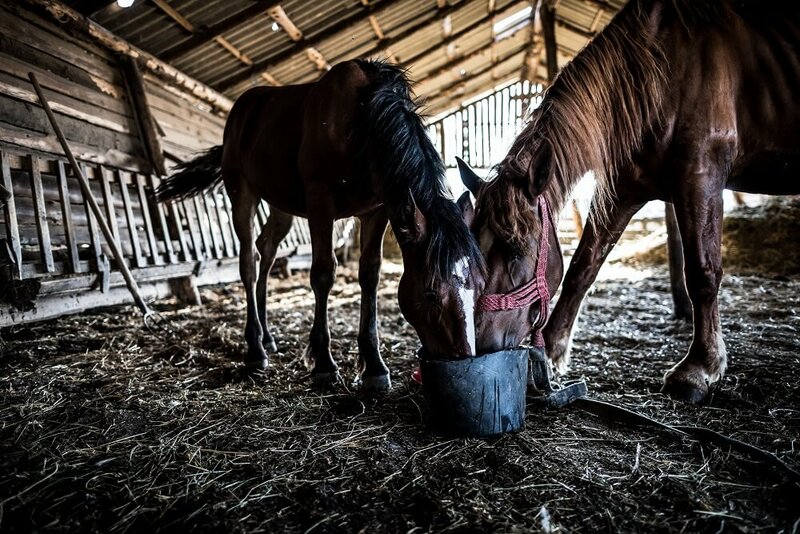 Just as with people, horses can survive (with severe health consequences) for about three weeks without food as long as water is well supplied. Without water, horses (and people) cannot survive more than a few (3-6) days. Just as with people, a simple pinch test can be an indicator of need for hydration. Pinch a fold of your horse’s skin and let it go. If it returns swiftly and smoothly to its natural position, this indicates good hydration. If the pinched fold of skin stays in a ridge for a few (2-5) seconds, it can be an indication of dehydration. The longer the skin stays ridged, the more severe the dehydration. If it remains ridged for longer than ten seconds, call your vet. If your vet performs blood work and finds high protein levels, this can also mean that your horse is dehydrated. Stress, strenuous exercise or illness (e.g. diarrhea) can cause dehydration in horses. Dehydration can cause lack of electrolytes (magnesium, potassium, chloride and sodium). This can cause kidney failure unless the horse is rehydrated quickly and electrolytes are replaced. Generally speaking, a horse should get enough magnesium and potassium from feed, hay and grass to provide for his needs. Keeping a salt and mineral block available at all times should take care of your horse’s need for chloride and sodium. These are the electrolytes that are most often lost through sweating. If you are feeding your horse properly and providing free access to a salt and mineral block and clean, fresh drinking water, your horse should not be lacking in electrolytes. Even so, some horse owners add electrolyte supplements to their horse’s water as an extra layer of protection against electrolyte depletion during competitions or hard work. This may be helpful in an emergency situation; however, this is not really the best or most effective way to provide electrolytes. In fact, some experts say that adding supplements to your horse’s water may actually cause him to drink less. Remember that the most important aspect of maintaining good hydration and proper electrolyte balance is water! Follow the same rules you would for yourself. Keep fresh, clean water freely available at all times and provide ample water breaks during strenuous exercise. If you are at a competition or trail ride or other event and you feel thirsty, check to see if your horse is thirsty, too. If you travel with your horse for trail rides, shows or competitions, you may want to accustom him to flavored water. When you do this, you can ensure that your horse’s drinking water always tastes familiar so that he drinks enough. To do this, you can add natural juice (e.g. apple juice) to the water. How Good Is Your Water? 1. What temperature is the water? It should be between 45 and 65 degrees Fahrenheit. 2. How fresh is the water? It should not be more than a day old. 3. How clean is the water? A horse trough may have some benign green algae growing on the sides, but it should not have dirt, horse manure, bugs or any other foreign substance present. 4. Is there enough water? Do you overfill your horse trough daily to displace old water with fresh water, or do you only fill it to the top? Worse, do you let it sit until it’s almost empty? Forcing your horse to scrape the bottom of the barrel to drink stale, dirty water is very poor horse care, indeed. It may be a good idea to purchase an automatic horse waterer. 5. Would you drink it? If you were really thirsty or had no other water available would you drink your fill of that water? If you wouldn’t, you need to change the water in your horse trough. Does A Horse Need More Or Less Water In Winter? In the spring, summer and fall horses who are able to graze freely may satisfy quite bit of their water requirements by consuming fresh greenery. In winter, when horses are more dependent on dry feed and hay, they may need more drinking water. 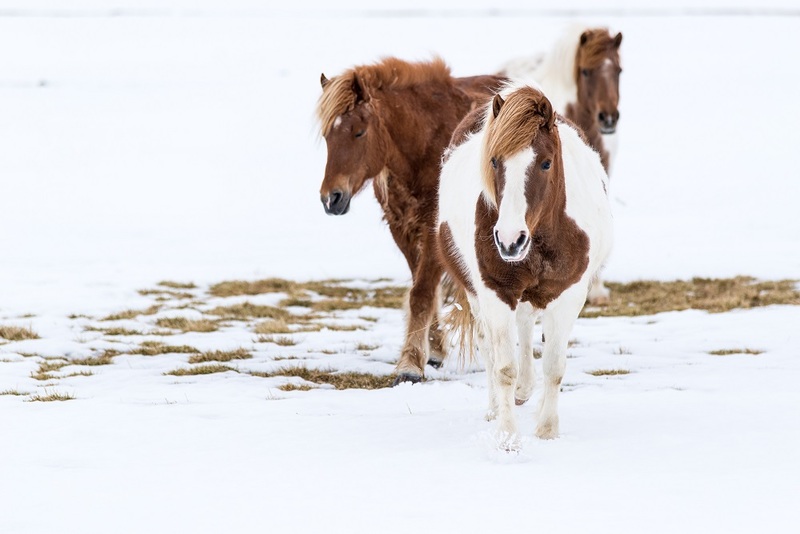 On the other hand, the winter months tend to be a time of relative rest for most horses, so from this point of view water requirements may not be as great. During the warm, active months of spring and summer, horses may need more water. It’s easy to see that, a horse’s water requirements are based on many factors. Extreme weather of all sorts may increase the need for water. Hot weather in summer or cold, dry weather in winter can be dehydrating. 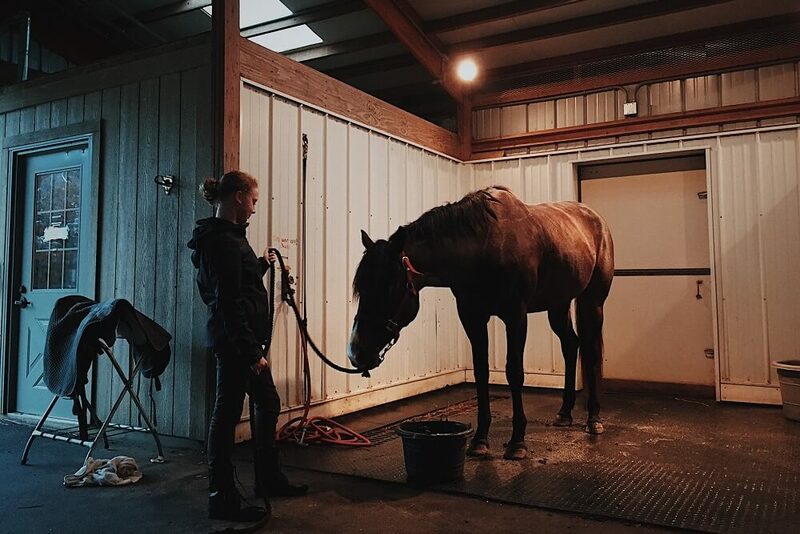 Because your horse’s need for water is determined by a wide variety of circumstances, it is very important to keep plenty of fresh water of a comfortable temperature available to your horse at all times. Year round, your horse’s water should be between 45 and 65 degrees Fahrenheit. In wintertime many horses seem to appreciate the warmer temperature. How Can You Keep Your Horse Well-Hydrated? You may want to begin determining the minimum amount necessary for survival. This is half-gallon or full gallon of fresh drinking water per hundred pounds of body weight daily. This means a thousand pound horse needs between five and ten gallons of water a day – minimum. If the weather is hot and/or humid, your horse is exercising a great deal or is pregnant or lactating, more water is needed. 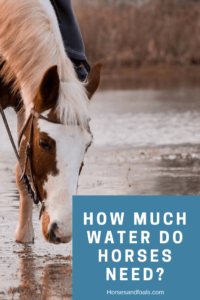 While it is possible to determine the minimum amount of water your horse needs in a day, providing your horse the bare minimum of water needed is not good stewardship. 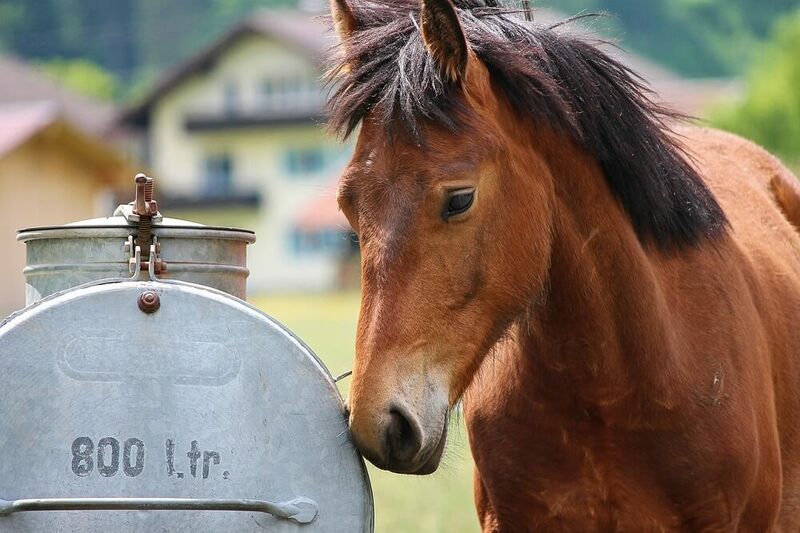 The simplest way to be sure your horse is getting enough to drink is to simply provide him unlimited access to water, just as you would like to have yourself. Providing plenty of clean drinking water will keep your horse healthy and content and will save you money and trouble in the long-run.